First off, I have no idea how I should format a title like that. On June 15 I picked up Pokémon Emerald from a Game Stop. I talking to the guy that works their for a while. After asking a few questions, I found out that GBA Pokémon games sales have raised since the release of the DS Pokémon Diamond and Pearl. Yesterday, I picked up my Resident Evil 4 that I reserved a few days ago from EB Games (#4834) located at Chesterfield Commons, 34830 23 MILE ROAD, Chesterfield MI, 48047 US, 1(586)725-1407. The day and time I was instructed to pick it up, I was told that they have yet to “open it’s box” meaning they didn’t open and catalog the games, even thou they told me they received this shipment hours ago. So basically they were just being lazy. Now I want you to keep this in mind, on the receipt for reserves at EB Games it says: “NEW RELEASE PRODUCTS WILL BE HELD FOR 48 HOURS AFTER RELEASE”. 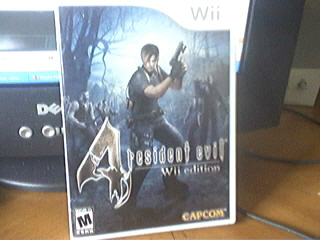 Resident Evil 4: Wii edition was released on June 19, 2007. I was contacted by phone to pick up my game June 20, 2007, I came late that day, and they didn’t even have the box opened, they told me to come later that day, so in actuality my game only available contractually for the for the 2-4 hours that the store was still open later that day, but to be fair I came six days later and picked it up. Anyways that day I also bought a GameCube controller extension(saving 19 cents with my Discount) and a reservation for Pokémon Battle Revolution. In case you have only bought A wii Points Card from 2006 and not 2007 or Vice Versa, I recorded a few changes as seen in the pictures, nothing major. Today Masahiro Sakurai Added The Legend of Zelda: Ocarina of Time Medley The DOJO.